The crucifix was an experiment with new materials (threaded metals and rope/twine), as well as a first attempt at a unit that can be unfastened & refastened to wood. On the journey to find a new home for my CDs, I spent quite a bit of time in Ace Hardware just browsing the variety of products they offered in many different shapes, sizes, materials and finishes. I started with the threaded rod because I liked how a sample CD sat on the threaded rod. From there, I purchased some material that could be used with the rod. 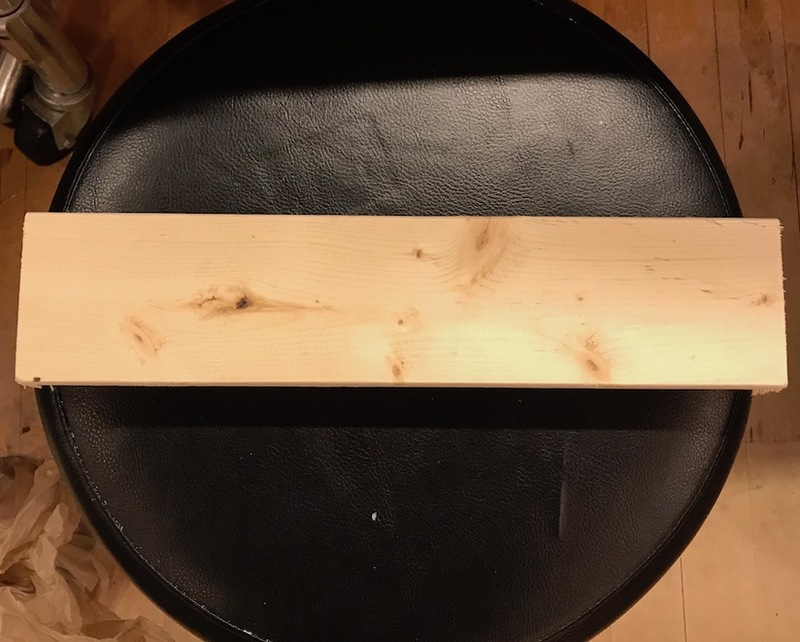 Next, I found a piece of wood from the junk shelf to test on. I then made the “rope” for the crucifix out of green twine. I chose green twine because I liked the color and thought it would hold taught for the intended effect. Use of this twine also gave me an opportunity to learn about knots! I used the resource 10 Rope Knots Every Hunter Should Know. Because I am a hunter? It turns out tying these knots is just as frustrating as tying a bowtie. Luckily a fellow classmate (Aiden Nelson) has nautical experience and showed me some stuff. I cut a long piece of twine, tied it into a loop with a square knot and then doubled it up twice for the 4 strand look you see below. The first cut of the twine was very close to the target length, but not enough to make a good crucifix. How are you supposed to measure something more than 3 feet long anyways? I had eyeballed this first cut and then used it as a reference for the next one. The next was was far too long. The on after that was just a bit too short. Finally, the 4th cut of this twine was a good size to create the desired effect. This was definitely the most frustrating part of the experience. I tied the twine to one of the fasteners, trying to make a clove hitch. I am not sure if this counts, but the coarse nature of the twine made it a taught fit. I then threaded the twine through the 3-way metal valve and down to the other side. Next I measured equal distance from the center rod and screwed in these ancient looking fasteners. Now the crucifix was read for use! 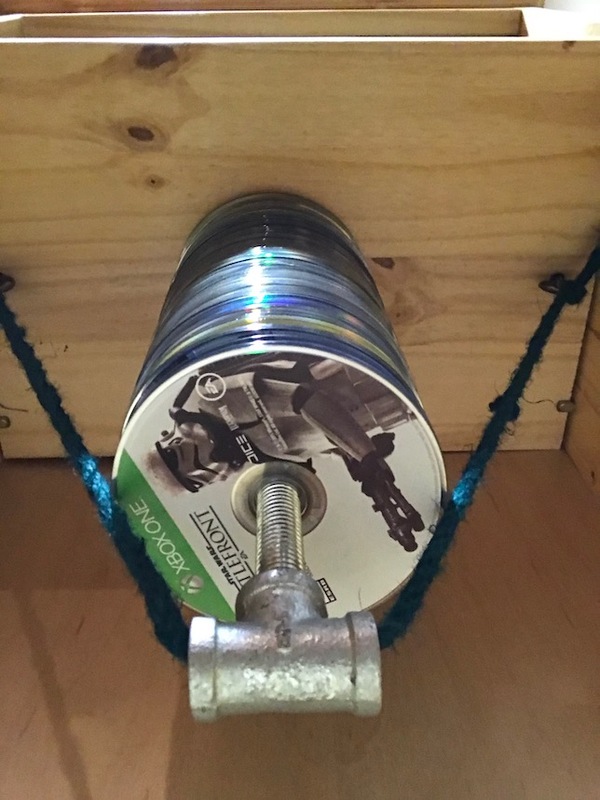 To add an CDs required one side of the twine to be untied, and the 3-way valve to be removed and then re-fastened. Yet this is a key part the crucifixion/capital punishment experience! Obsolete tech doesn’t just torture itself. ?